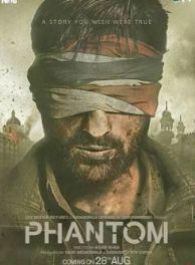 Phantom is a upcoming post 26/11 counter-terrorism drama film directed by Kabir Khan, and produced by Sajid Nadiadwala. It stars Saif Ali Khan and Katrina Kaif in leading roles. one of the best movie in 2015...their is many loop holes in film...still I love the movie. Specially the Msg. Tagline of the movie is perfectly right - A STORY YOU WISH WERE TRUE. As told earlier in movie that it is based on Novel "Mumbai Avengers" by author Hussain Zaidi. A court martial Army office accept the covert operation by RAW to go and kill everyone involved in 26/11. Film is not against the pakistan or any other country but film is against terrorism. Good Job done by Kabir Khan, Saif Ali Khan and Katrina too..
Rajkummar Rao's 'Trapped' trailer is out and its gripping! Hrithik Roshan-Deepika Padukone to share screen space!